Are you looking for a New Year’s resolution that will help women artists and be a lot of fun? Would you be willing to see one film or play by a woman every week this year and Tweet about it? If so, be sure to check out the two inspiring initiatives described below, #52FilmsByWomen and #52PlaysByWomen. Inspired by Women in Film’s success, a group of women in theatre have started #52PlaysByWomen. Once again, the rules are easy. 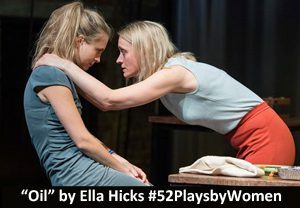 Simply see or read a play by a woman or woman-identified playwright once a week for a year and announce the play and playwright on Twitter each week with the hashtag #52PlaysByWomen. The play can be any length. Readings and workshops of women’s plays count. You can read more about the guidelines here. You can follow 52PlaysByWomen on Twitter or search for their hashtag to see what other people are watching and reading. The goals of these two initiatives are to increase the visibility of women in film and theatre on social media and to get audience members into the habit of seeing and supporting work by women. Both of them are purely voluntary and operate on the honor system. If you can’t see a film or play every single week, you can still participate by using the hashtags to publicize whatever works by women you manage to see. Finding 52 Films by Women: Film Fatales has compiled a list of 245 films by women that are available on Netflix. Also, there are lists that have been compiled by Women in Film’s Senior Director of Education Gayle Nachlis, and their Communications Coordinator Morgan Green. You can also follow Women in Film Los Angeles on Facebook and Twitter to find more lists and ways to watch films by women. Jan Lisa Huttner, the co-founder of Support Women Artists Now Day/SWAN Day and founder of WITASWAN (Women in the Audience Supporting Women Artists Now), has over a hundred of reviews of films written or directed by women on her website, The Hot Pink Pen. She has also published a book of film reviews, Penny’s Picks: 50 Movies by Women Filmmakers. You can find her latest reviews on the Film Reviews page on the WomenArts website. WomenArts also maintains a page of Websites about Women in Film , which has links to websites where you can rent or purchase films by women and websites with specific information about films by African-American women, Asian women, women over 40, lesbians, and experimental women filmmakers. Finding 52 Plays by Women: Since only about 20% of the plays produced in most towns are by women writers, it may be hard to attend one production per week of a play by a woman, but there are plenty of women’s plays to read. Special Thanks: Special thanks to Laura Shamas for telling us about these initiatives and writing part of this post. There are a number of other initiatives around the country that encourage people to see films or plays written or directed by women – often with monthly gatherings. We have listed a few of our favorites below. If you know of others, please tell us about them, and we will post them on our Facebook page. WITASWAN Monthly Film Groups – Back in 2004 Jan Lisa Huttner, the co-founder of Support Women Artists Now Day/SWAN Day, created WITASWAN (Women in the Audience Supporting Women Artists Now), a grassroots movement of people who took a pledge to see films written or directed by women once a month. Many people have attended films or watched videos by women on a monthly basis in WITASWAN groups. Please feel free to start a chapter of your own with your friends. Parity Productions (Formerly Works by Women) – New York’s Parity Productions is a non-profit organization that develops new, original plays by women and transgender artists, and promotes the work of other theatres that do the same. They maintain a list of current New York productions where at least 50% of the artists are women or transgender. Works by Women San Francisco – Works by Women San Francisco is a blog with an affiliated Meetup group in the San Francisco Bay Area. The blog covers local theatre productions featuring women writers, directors, and designers, and members of the Meetup group attend women’s plays together approximately once a month. Stage Source Parity Parties – Boston’s StageSource has a Gender Parity Task Force that gives productions a “Standing O” if they hire enough women or transgender people in key creative roles. The task force also hosts “parity parties” to attend the “Standing O” productions. This entry was posted in Art Forms, Film, Theatre, Video on January 2, 2017 by Martha Richards.